If you read my previous article and you found the tips helpful then you must be feeling better already. In this article I will share with you my top products that I use in my daily life. I love them because simply: they make me feel good, my skin glow(ier), my hair shinier and my nails stronger. So, of course I highly recommend you trying some of these if you want to get more glow and sparkle in your life. And, who doesn’t want that? I have dry skin so I love this rich hydrating overnight mask. It contains avocado and apricot oils to deeply quench dry skin and helps build a reservoir for the next day. It also contains, Japanese seaweed which repairs the skin’s barrier to prevent future dehydration and signs of premature ageing. When I wake up my skin feels plump, refreshed and super soft! With a touch of rose, a touch of chamomile and lavender, this warming tea really soothes the soul. A tea made with love, dedicated to love and called love. Perfect for filling your heart and soul with…love. What’s not to love? I love this bronzer. I have used it for years and can’t imagine myself every changing to a different one. It goes on so smoothly and doesn’t feel like you are wearing make up. It adds a lovely warm healthy glow and has a soft matte finish. So, on those days when you’re not feeling so perky… no one will every know. This is my indulgent bedtime treat. It actually costs less than a coffee per day but it does feel expensive on purchase. However I love it, so for me it really is worth it. I have a super sweet tooth and always want pudding. So, instead I blend a scoop of Serenity with almond milk and cashews and heat for 1 minute. It creates a smooth, creamy hot chocolate that not only tastes good but also has soothing properties to send me off for a good nights sleep. It also contains protein so it helps with muscle recovery from your days workout while you sleep. Typically used for cold sores, however cold sore or not, I love this cream. I find other products actually make my lips feel drier. However, this cream is amazing. It leaves a lovely fresh tingly feeling whilst really deeply moisturising. I love this stuff and buy it in every season and use it daily as part of my cleansing routine. Plus it is so cheap compared to a lot of other products out there that in my opinion aren’t half as good. This is a new discovery for me which I have to share with you. Neal’s Yard do a 500ml body cream for £14.50. The cream is plain and all organic so you can use it on your body and face. Alone this is a wonderful product, and if you haven’t gathered by now, I know my moisturisers! However, there’s more. Because it is plain you can choose to blend your choice of oils. I love the ‘women’s balance’ blend, it smells incredible and includes essential oils: geranium, rose and frankincense. Not strictly speaking a product but it has to go in this list. If you are lucky enough to live by the sea I would highly recommend getting as many sea swims in your life as you can. I can’t even begin to tell you how much I love this as part of my weekly feel good/get the glow ritual. A sea swim instantly lifts my mood, make my dry skin feel so much softer, gives me a glow (I think that’s because it’s so cold so my blood has to pump so quickly round my body to warm me up) and it is really good exercise. A holistic daily supplement full of live cultures. Probiotics simply are ‘good bacteria’ without the added sugar (found in some supermarket ‘good bacteria’ products) they are top quality and keep your gut happy and balanced. On awakening I always have a big glass of warm water with a squeeze of lemon. This is great for hydration, alkalising your system and sets you up for a good day. It is a really simple, easy addition to your glow routine so, of all the things in this list this is the one I would really highly recommend above any of the others for it’s simplicity, ease and cost. This is another of my slightly indulgent products. However, please forgive me… my boyfriend is a hair stylist and this was a recent discovery when I was in the salon with him. This is actually a hair oil but, I use it on my hands and it’s a game changer! So, if you suffer from dry cracked hands this is a must! It’s actual use is to nourish hair, tame frizz and reduce damage to the hair. So if you have dry hair this is awesome for you too. The wonderful thing about it is it is completely organic and made from natural oils such as: Argan, Avocado, Jojoba and Coconut and nothing nasty whatsoever! I hope you enjoy my get-the-glow list and you find some of the listed products as joyful to use as I do. 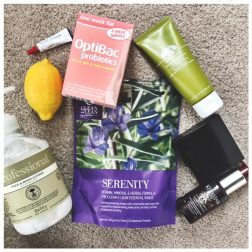 I am sorry they are very much geared towards my skin type/health routine however, I am sure that there are some that you will love for you too. And, if you are a dry skin type then you could have hit the jack pot with this list because they are all very much tried, tested and loved. Coming next: Ellie’s top fitness tips, for a healthy, strong mind and body.